Published: Nov. 8, 2012 at 10:06 a.m. But something strange has struck me this year in that Luck somehow has become a third-wheel when it comes to the rookie quarterbacks. Robert Griffin III has far-and-away been the guy with the most media attention (or at least the most commercials), while Lauren Tannehill made her husband a star in South Beach. Yet we still don't seem to see enough of Luck. This doesn't feel right to me. With that in mind, I will now present six reasons why you should root for Luck in the 2012 season. 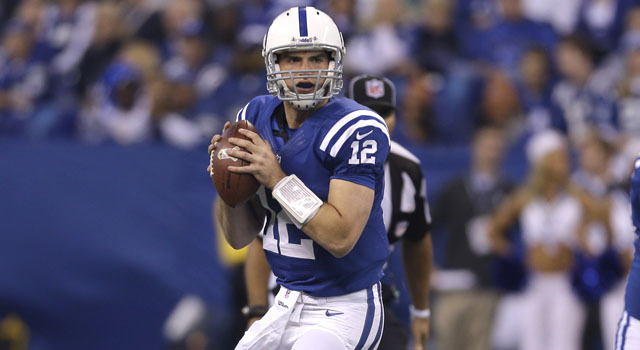 Luck was born in Washington D.C. but was whisked off to London and Germany because his dad was a general manager in the World League of American Football. (And I guess it should be noted his dad was former NFL quarterback Oliver Luck.) Before he ended up in high school in Houston, Texas, Luck attended Frankfurt International School. That's kind of cool. I once went to summer camp in Perris, Calif., so I guess I can kind of relate. Speaking of high school, Luck placed third in homecoming balloting at Memorial High School. Big deal you, say? Well, he attended Stratford High School in Houston, which was the rival for Memorial High. In other words, Luck was so well-thought of, his rivals wanted him to be their homecoming king. Luck received a good amount of attention from the big-name schools when he was in high school, but he chose his college based on his academics and not BCS ranking. And to make it even better, he earned his degree (at Stanford mind you) before he came to the NFL. And no, not in the sense of being a tough football player who finds a way to win - though he does that. Instead, Luck likes to play video games, as evidenced by his appearance in a recent EA Sports commercial. And yes, even though it was for the soccer video game, we're willing to let it slide. As a lot of athletes have proven in recent years, maybe we shouldn't have direct access to your thoughts. Isn't that right, Marcus Vick? But Luck has chosen not to be on Twitter. And maybe more athletes should follow the lead. Of course, the ironic part here is that the one of the athletes who would probably be thoughtful and worth following on Twitter isn't. WLuck showed no ego when he shaved his head, along with some of his fellow Colts teammates, to show support for coach Chuck Pagano. I know there are some team leaders who might not be willing to make that step (I think we all have a few in mind). But Luck doing it, dang, if this doesn't make you want to root for him, nothing will. "Reasons to root for Ryan Tannehill..."